This winter, there's no hibernation allowed. Hit snooze and you won't lose any extra weight. Get outside to burn fat and melt snow with this series of fun winter workouts! If you think winter is the time to hibernate like a bear, we&apos;re going to do more than jingle some bells your way - we&apos;re going to sound alarms and bang gongs in your grill to get you up and moving. We&apos;re going to ask you to get moving outside, where it might be a bit chilly right now. Not to worry: We found six fun activities you can use to torch fat, get in shape and look your best by spring. Winter activities can burn calories fast because many are high-intensity and require you to work against the resistance of the snow. You&apos;re also going to likely set some New Year&apos;s resolutions that will be program specific, so you&apos;ll want to get back into the gym by January 1st. So, between now and then, use the time to shake-up your fitness routine. By adding some alternate activities into the mix, not only can you give your body a break from the usual routine, but also challenge yourself in new ways. If you want to build up your quad power, try this exercise. Cross country skiing is ideal for strengthening your lower-body muscular endurance. Unlike downhill skiing, it also challenges your upper body as you propel yourself using the poles. Cross country skiing is comparable to running, if not more effective, for increasing your endurance level. No, we&apos;re not talking about Dad&apos;s old galoshes. If skiing has never been your forte, consider snowshoeing instead. You won&apos;t work your upper body as much as you would with skiing, but your lower body will get an even better workout. Lift your foot out of the snow before placing it back on the ground; this places intense demands on your body. Snowshoeing will really target the hip flexors and quads, and also test your balance and agility. Most people grossly underestimate just how intense this workout is until they actually give it a try. If you do try it, be sure to wear proper snowshoes and footwear to maximize your comfort. For those who prefer ice to snow, skating is the next outdoor winter activity to start including in your workout program. Plain skating will burn a considerable amount of calories. Yet if you crouch lower and sustain close to a 90-degree knee bend, the calorie burn will be enhanced dramatically. Also, the deeper the knee bend, the more your quads and glutes will be activated, leading to more power development. Similar to rollerblading, this is a fantastic calorie-burning sport if you skate intensely enough. If you&apos;re competitive, challenge a few friends to skating wind-sprint races. This is one of the best forms of interval training. Fun, too. While it may not be considered the most enjoyable winter activity, if you want to burn calories fast, shovel your walkway or driveway. Like I said, no hibernation allowed. The great thing about snow shovelling is that if you do it for 15 minutes or longer, not only will it provide you with a fantastic cardiovascular workout, but you&apos;ll be working every single muscle in the upper body. Even the core will get a fantastic workout; it will have to contract hard to perform the shoveling action and keep you balanced. If you can&apos;t make it to the gym for your normal upper body workout, this one can easily stand in its place. Just be sure that you are lifting with your upper body strength and not your back to avoid back pain. Snowboarding is another good exercise to consider this coming winter. 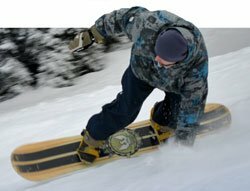 Snowboarding is great for those who prefer not to ski and who want to work their balance and agility skills. Since you&apos;ll be forced to maintain your foot position while doing this activity, this will call the core into play to a much higher extent than it is during skiing. Furthermore, snowboarding is going to work many of the smaller muscles throughout the hip region as they contract and work to stabilize your body. Finishing off our winter activity list is tobogganing. This one is perfect if you have young kids or just want to get out for 30 minutes before relaxing by the fire. The calorie-burning power of tobogganing depends on the amount and steepness of the hills you climb. But if you are climbing with intensity, tobogganing can rank as one of the higher calorie-burning forms of exercise. Because you&apos;re pulling the toboggan behind you as you climb up the hill, you&apos;ll have that added resistance to really force all the muscles in the body to work hard. You target the glutes and hamstrings especially with this activity. Anyone who wants to get a firmer backside should turn to this activity. As you go about your holiday shopping and preparation, don&apos;t forget to take some time to consider the outdoor activities you can work into your busy schedule. These fun, social, winter workouts might be just what you need to jumpstart your new year fitness program.